Illumination Vinca is also known as Periwinkle. Bowles Vinca has yellow green variegated leaves with purple flowers that bloom in spring. The vines will spread and cover 2' to 3' while growing 4" to 6" tall. 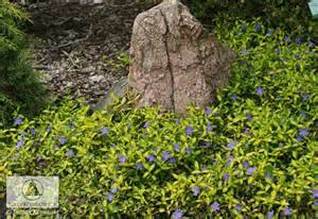 Plant Illumination Vinca in partial sun to full shade in moist, well drained soil. Use Illumination Vinca as a ground cover, erosion control, Cottage Garden, Woodland Garden, next to ponds, streams, or boggy areas. It makes a great hanging plant for containers. It is deer resistant and is also a Firewise Plant.